Gralem wczoraj we Frankenstein i pomimo ze zapowiadali go, ze bedzie to super slot to mocno sie zawiodlem. Do Gonzo nie ma startu, wg mnie. 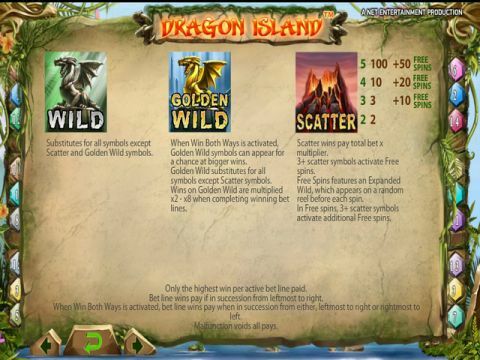 Pierwszy automat video z funkcją "Win Both Ways"
"Dragon Island" to pierwszy slot Net Entertainment z funkcją "Win Both Ways", która daje graczom szansę na wygraną w kombinacji symboli zarówno od lewej do prawej jak i od prawej do lewej. 3+ scatter symbols activate Free spins. Conventional slot symbols are cleverly replaced by a deck of cards and the player bets on winning Poker Hands appearing along 5 bet lines. For added excitement, a single Joker card is shuffled in and doubles the wins when it completes winning hands. But the thrills really take hold in this game during Free Deals, which features a x2 multiplier on all wins. The action never ends at the Kings of Chicago table. An innovative and unique game is once more about to be launched . Maiden ™ Mythic displayed brings innovation to the Free Spins with a featured Iron Maiden. Players lucky enough to find 3 or more scatter symbols will unlock the Iron Maiden. Once opened, players will be excited to see Their Winnings Increased by up to x10 and / or Awarded additional free spins of up to two from within the Iron Maiden after every spin of the reels. Slot pojawi sie w pierwszej połowie grudnia.